Is Content Marketing Aligned With Your Company Values? This statement by consultant, researcher, and lecturer Simon Sinek sums up what I see as the fundamental principle, the core value behind Content Marketing. Content Marketing as a communications and business strategy will succeed when used by a company or organization that values helpfulness, education and empowerment of their customers. Content Marketing is the natural language of a company that has a culture of helpfulness, service, and customer education. I’m going to show you how this is true, and what Sinek means by his curious little sentence. I admit, I have a problem with plumbing. I know I have a lot of gaps in my knowledge about pipe threads and which plastics work with which glues and whether or not a ¾-inch pipe is that size on the inside or the outside or in the middle somewhere. So a plumbing repair for me is typically accompanied by increasing frustration over newly sprouted leaks and expensive, multiple trips back to the store. Lately though, I’ve become acquainted with a remarkable older gentleman (I’ll call him Frank) who works in the plumbing department of my local home improvement store. When I’m trying to solve a plumbing problem, Frank is often able to steer me toward a solution, with a minimum of wasted time and expense. Whenever he’s on hand, I know that I’ll leave the store more empowered and more knowledgeable, whether or not I’ve purchased anything that day. I may have learned that I need to go to another store, or even take a completely different approach than what I had envisioned when I arrived. Through information alone, I’ve moved closer to resolving my problem. Frank demonstrates expertise, generosity, and genuine interest in my needs and questions. At the core, he is being a good neighbor, a fellow citizen, a fellow human being. For him, it’s not just about being a worker or an employee. Which Experience is More Appealing To You? Which type of shopping experience do you prefer? One where the clerks leave you alone or avoid eye contact, then simply take your money with a mechanical “Have a nice day!” at the end of the interaction? This is my experience in many national chain stores, when I grudgingly shop there out of convenience or product-availability pressures. Or are you, like me, the type of person who finds it pleasant when a clerk notices that you’re searching, and offers to help — respecting your choice of accepting the help or not? Do you appreciate a clerk who is deeply knowledgeable about the products, and can compare and contrast them for you? Are you reassured when the sales help shares personal experiences of using the products they sell? Which Experience Does Your Company Provide? 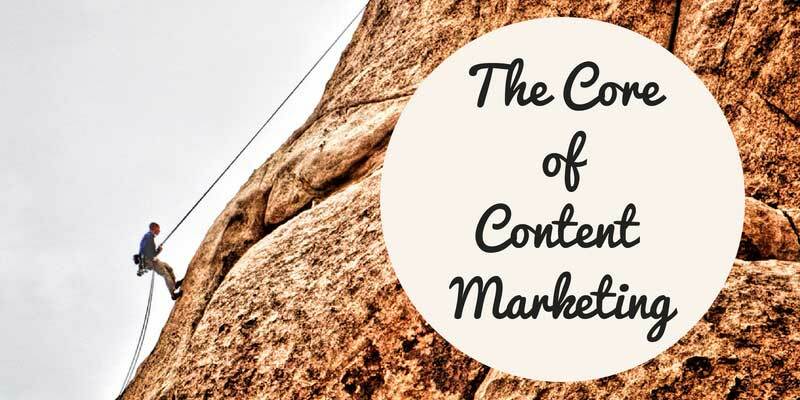 I see Content Marketing as a fundamental orientation for a business. It’s an intentional, values-based decision to be outward-directed, generous, and helpful. Content Marketing is based on human evolution and behavior, and powered by our built-in, highly-developed social wiring. The wiring that tells us whether or not we can trust others. Whether or not we should believe someone. Whether or not we should ally ourselves with one group or another. My socially-wired brain tells me, at a deep level, that I can trust the store that employs my helpful plumbing consultant. That I should align myself with it, that I should give them my money. That I can and should recommend that business to my friends. And I will go back, again and again. I’m less likely to shop around for the products the store carries. I won’t quibble over price as much. I know what I buy will work and will save me time. Shopping there doesn’t feel like a task or an imposition, it feels like something I must do and want to do. Our newest brain, our Homo sapien brain, our neocortex, corresponds with the “what” level. The neocortex is responsible for all of our rational and analytical thought and language.The middle two sections make up our limbic brains, and our limbic brains are responsible for all of our feelings, like trust and loyalty. It’s also responsible for all human behavior, all decision-making, and it has no capacity for language. In other words, when we communicate from the outside in, yes, people can understand vast amounts of complicated information like features and benefits and facts and figures. It just doesn’t drive behavior. When we can communicate from the inside out, we’re talking directly to the part of the brain that controls behavior, and then we allow people to rationalize it with the tangible things we say and do. This is where gut decisions come from. You know, sometimes you can give somebody all the facts and figures, and they say, “I know what all the facts and details say, but it just doesn’t feel right.” Why would we use that verb, it doesn’t “feel” right? Because the part of the brain that controls decision-making doesn’t control language. And the best we can muster up is, “I don’t know. It just doesn’t feel right.” Or sometimes you say you’re leading with your heart, or you’re leading with your soul. Well, I hate to break it to you, those aren’t other body parts controlling your behavior. It’s all happening here in your limbic brain, the part of the brain that controls decision-making and not language. But if you don’t know why you do what you do…then how will you ever get people to vote for you, or buy something from you, or, more importantly, be loyal and want to be a part of what it is that you do? Again, the goal is not just to sell to people who need what you have; the goal is to sell to people who believe what you believe. Source: Ted talk transcript. Sinek sums it up as: “People don’t buy what you do; they buy why you do it.” This little sentence is extremely powerful, and important. It is what distinguishes great companies from their competition. If you have alignment between your mission (why you do what you do) and your communications to your customers, the limbic brain systems of your customers will kick in. The customers will “buy” into your “why.” They feel a kinship, a deep alignment. I see successful Content Marketing as acting on a business’s desire to educate and inform customers, with the goal of exceeding the expectations of their customers. A business demonstrates that it is sincerely helpful,useful, and trustworthy. That’s the why you do what you do. If being helpful, useful, and trusted are your values — and you stay authentic to those values in your communications — your customers will see it clearly. It will be as apparent as the helpful hardware store clerk you know you can rely on. The flip-side of these same brain systems is we humans also have the ability detect insincerity: we just “feel” it. I believe this is among the most likely reasons for content marketing failure in some companies. They may pump out reams of content, but it doesn’t smell right. It doesn’t feel authentic. It seems forced or artificial. That means it can’t be trusted. Content Marketing works well for organizations that are genuinely helpful, useful and trustworthy to show those qualities through their websites, their social media interactions, and all of their customer communications. If an organization’s ownership and management isn’t committed to those core elements, the Content Marketing approach is not for them. It won’t work. If your CEO isn’t aligned with these values, you are unlikely to have any lasting success. When information is given, but the giver is interested only in our money, not in our benefit, we can tell. When a representative of a company follows a script, and doesn’t really believe what she is saying, we can tell. Our social brains are too finely tuned to allow us (as consumers and the target audience for a great deal of published content) to fall for that type of manipulation. Smaller B2B companies who value long-term relationships with vendors and customers, because trust and expertise are so important when the interactions are ongoing. Smaller professional service providers, who have expertise and are worthy of being looked to as trusted advisors, consultants, and partners. If you believe business should be based on these core values, and your leadership is aligned with them, it’s almost certain that Content Marketing will work for you. It will be a natural part of everything you do. People don’t buy “the same hardware you can probably buy anywhere in town.” They buy “we’re here to help you master your challenging home repair projects with expert help and information.” Why you do what you do in business is your core value. It’s what drives you. It’s what motivates the plumbing clerk to speak voluntarily from the wealth of his knowledge and life experience of solved problems. It motivates the cashiers who ask whether you found what you needed, the managers who trained them all in alignment with with the company’s values. And it motivates the CEO or president or owner who decides which values will be most important to the business. Why do you do what you do? P.S. — If you’re not one of the 17+ million people that have seen it, take 20 minutes to watch Simon Sinek’s Ted talk. On second thought, even if you’ve already seen the video, I recommend you watch it again. It may change how you think about Content Marketing. 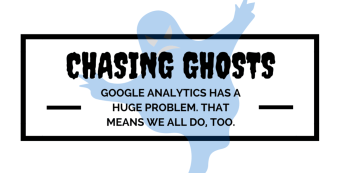 Many small businesses rely on Google Analytics to help them understand how well their online marketing efforts are working. This resource is being crippled by opportunistic spammers. Here’s what you need to know to protect this important data, and improve your marketing intelligence.